The COB LED grow light review, what is a cob led grow light? 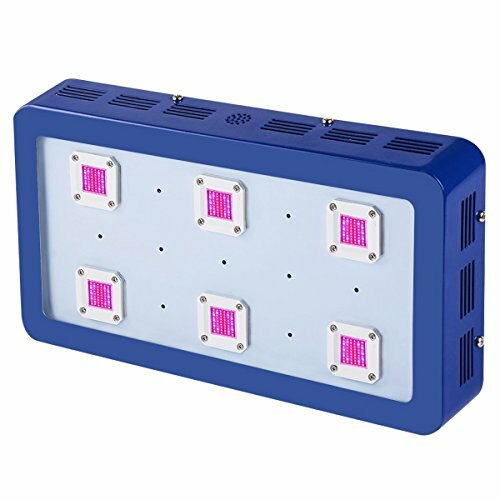 Short and simple, an indoor grow light technology that has developed tremendously over the years. At the present moment, COB LED lights are considered to be the most viable and significant. Here, we cover the best brands in this category so that you can have it easy making a choice. Most indoor growers miss out on the importance of proper lighting. When your plants don’t get the light they can actually use, they get weak, become susceptible to disease, and cut on yields. COB LED Grow Lights could never have come at a better time when plants need to grow faster, healthier, stronger and give plenty of fruit. With COB (Chip on Board) LEDs, you get a full blend of light. It runs cool, thanks to their engineering. It focuses the light better since it combines many LED chips rather than lenses in one module such that instead of seeing the light come from individual segments on the light panel, it appears to come from one. Continue reading our full cob led grow light review to find out which of these lights fits your needs better. The initial investment for a COB LED is always higher than in regular LEDs. But you don’t have to cough that much money to acquire yours. We have found just the right design for you. The King X6 is not only inexpensive, but it also screams performance and reliability. We love that it covers the full spectrum from 410nm-730nm. 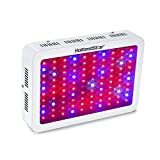 It produces just the right light which your plants will use and grow much faster. For those who are into indoor hydroponics, you know how much light distribution means. You don’t want some plants to appear stronger than others. That’s what the King X6 is all about. 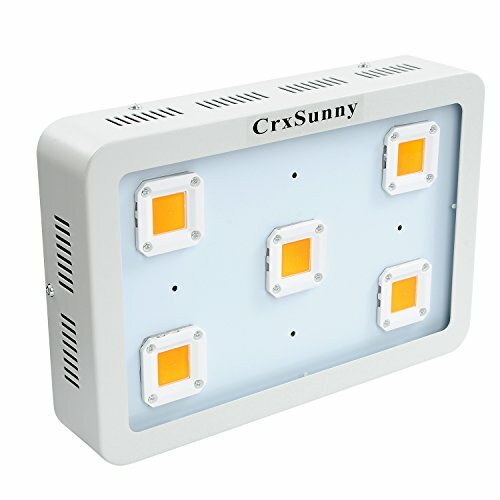 It boasts a total of 1800W by using 6pieces of LED chips each giving 300W. It produces a broad range of colors from blue, red, infrared and UV. This means you’ll be able to use it over the full lifecycle of the plant. Energy efficiency is the name of the game. The engineering sees a LUX design which simply means a spotlight. It only consumes 324W power which is much less than what you’d need for an HID (High-Intensity Discharge) light of the same wattage. What’s more, it can manage any heat that it emits through two decent fans. It also has vents which draw in air to cool it even further. The coverage is an important aspect of this light. It feels at home in greenhouses, indoor grow spaces and commercial hydroponics. It can cover an area 4.2x6ft at the height you choose. And, because it does not have hot spots, you’ll be able to hang it a little closer to the canopy when it comes to the flowering stage. This is not an entry-level COB LED, and as such, you should expect it to meet the 50,000 hours lifespan. Are you looking for the perfect sunshine replacement for your indoor garden? Your search ends here with the CrxSunny COB LED Grow Light. It can exude 1500W of sunshine using only five LED chips. Not to mention it covers the full spectrum from 380-730nm. It is ideal for your plants from their vegetative stage to blooming since the wavelengths have the energy to penetrate far and deep into the crops. The sophistication of this lamp beats what you on standard LEDs. Instead of using 3W chips which are distributed on a wide panel, this one concentrates the light in five LEDs. It does not suffer instability, emitting lots of heat or even giving you a huge difference in your electricity bills. Every wavelength is equal, be it blue, red, green or yellow. You’ll see a perfect blend which reaches every corner of your grow tent. The heat sink is fashioned in a 3-in-1 module where it resists heating up. This way, you’ll not have to invest in extra ventilation and cooling systems. In fact, this light boasts running 45degrees cooler than other grow lights. Its working temperature between -20-40degrees Celsius is in the interest of ensuring your grow space maintains the right temperature for your plants. It encourages a healthy growth which keeps your plants safe from attracting disease. With a timer, you can control this system to run at the intervals you want. You can leave it on for 12-14hours in the vegetative stage, 12hours in the flowering stage and up to 8hours in the fruiting stage. Not to mention, it can hang as low as 14inches or as high as 24inches to get you just the yield you deserve. 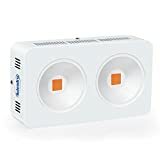 The coverage for this model is 3.8×4.2sqft so whether you are using it for potted plants or a weed grow tent, you can be sure it will light up every inch. Anjeet is definitely an option for those who want to cut on costs of setting up their grow kit. Initial capital is not always an easy thing to find, but you can’t afford to make compromises when it comes to growing indoors. 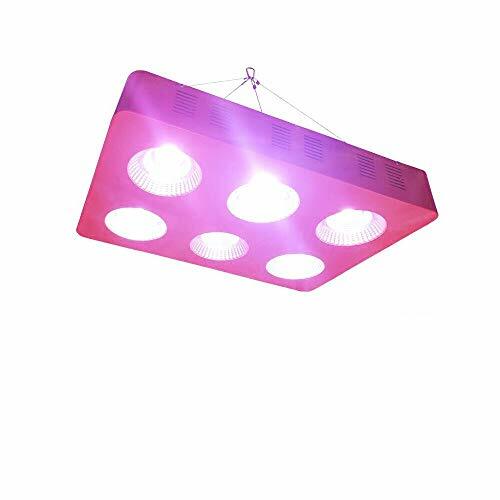 With the proper grow light you are set for success so that you can enjoy fresh fruits and vegetables like persons who have acres to spare. The Anjeet is a COB LED grow light which uses six chips to achieve an even spread of light. It is the best effect of the vegetative stage to gives your plants juicy stems and vibrant leaves. The root system develops to support the plant in high absorption of water and nutrients. It hastens the flowering stage, and in no time you have huge buds which bring forth bright petals which suggest the fruits will even be juicier. All this is thanks to the full 380-780nm full spectrum light wavelength. This panel uses a patented optical reflector which enhances the PAR energy. It achieves the most optimal color ratio which distributes the color evenly over the plants. Together with the color uniformity, is high luminous efficiency which sees that every module runs individually. When one module breaks down, the others continue operating. And. You can also replace every module independently. The Anjeet is quite a durable product seeing that it can manage its heat dissipation. It makes it possible for the plants to absorb up to 80% of the light it emits. This means that not much light turns into heat energy; hence it does not have much to give off. The side vents and fans all make it possible for this unit to remain cool for the longest time. What’s more, since it does not heat up it is deemed to last a very long time. This cob led grow light review could be easily expanded upon, unfortunately, this is all the space we have today. 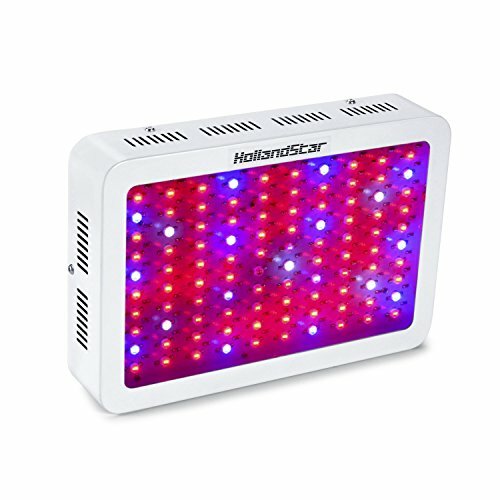 The HollandStar covers a full spectrum to produce wide coverage and deep light penetration to all your plants. It suits indoor gardening of all fruits and vegetables which need ample sunshine to bloom and be healthy throughout their life cycle. What else could you ask for when you have 1000W of LED in only five chips? You get concentration, high luminous efficiency, and above all, your energy consumption does not go overboard. This is the light you want for a full season when it cloudy or if you live in a college dorm where there are restrictions in bills but still, want to have beautiful flowers grace your living space. The best thing about it is that it operates at optimum temperatures which encourage a healthy environment for your plants. It does not have any limitations on the coverage seeing that it can light up to 3×5.6ft. he flowering stage is good to go with up to 12hours. This way, your plants will absorb as much light as possible, use up water and nutrients efficiently to produce much more fruit. Better still, the spectrum out is manageable so that you can set that which impacts the plant at a particular phase. This panel skips on using holes in glass sheets and instead it uses an aluminum cooling heat sink. It achieves 70% less heat emission when compared to HIDs. What’s more, it comes with an alloyed hanging hook which resists corrosion and rust. Even though it’s not entirely waterproof, you’ll be able to use it when it’s damp in your grow tent. HollandStar is here to stay, and you better pick a piece to start reaping the benefits. Roleadro is a renowned brand in the LED Grow Lights industry. It boasts some of the best designs in conventional LEDs, and their COB model beats the rest of them to emerge top of the list. 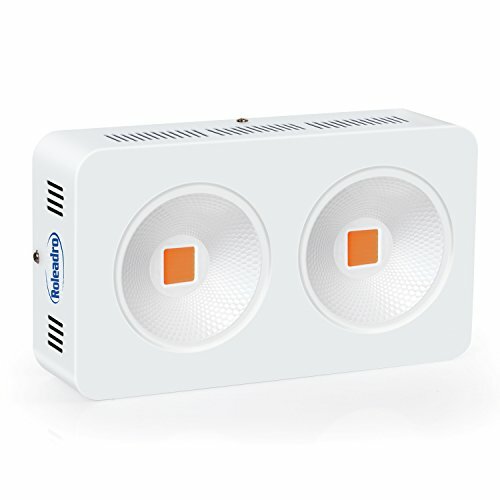 This particular lamp uses two modules to produce the 400W full spectrum lighting. It covers the 12bands in the 380-780nm range. This way, you can grow your crops in total darkness, and they’ll have the best sunshine wavelengths. This unit is engineered with a high luminous reflector. It reduces light loss such that every wavelength it produces gets absorbed up to 90%. When most of the light is utilized, your plants will thrive, and you’ll have higher chances of harvesting in plenty. The light angle has a great impact in that it allows for the panel to distribute light efficiently. And, when you use a mylar lined grow tent, it reflects the light back to the crops. With this lamp, you can be sure of continuous lighting throughout its life. The module design sees to it that a burn out on one does not reflect on the other. It is also easy to repair such that it can continue working in the best condition. You don’t have to fumble through a series of user instructions to operate it. With individual ON/OFF switches, you’ll be able to manage the wavelengths in according to the plant’s face. The construction of this unit is very mindful of your energy uses. It draws little power and does much better when it comes to overall cooling. The two modules occupy a large surface area. Any heat emitted distributes over a wide area hence it is lost before it even reaches the outer surface. It permits you to hang it low enough without having to fear a single burn on a single leaf. It can work up to 18hours a day and not experience instability. As you make your choice, you may have some few unanswered questions. What Benefits Do You Gain By Picking COB LEDs? Effective Spectrum-instead of having a few LED chips spread out, you have modules which offer a targeted spectrum. The PAR rating is much better as not much is lost because of the uniform distribution. Better Heat Distribution- the light by COB LEDs is not heated. The blended in color means that the effect infrared and UV heat has is small. The panels are built to absorb back the heat, and as such, the unit never gets hot to the touch. High Life Expectancy- the average rating of COB LEDs is 40,000 hours. This means even though the initial price is a bit higher, you’ll get full value for your money. We hope you liked our cob led grow light review. As you have seen, there’s everything to gain from a COB LED Grow Light. With the brands on this list, you can be sure of picking only the best. They have top ratings, high-quality designs, and attractive prices. Don’t just take a peek, pick your model and give it a run!